You are here: Home / Archives for EO Technics Co. Ltd.
EO Technics is a globally-renowned leader in the laser-based application industry. EO Technics develops and sells high-precision laser technologies and allied solutions. It offers laser markers, which are used to record information like date, name and sorts on the surface of wafers, inside of flat-panel displays and other materials. EO also offers laser cutters, laser drillers, lasertrimmers, laser patterning and others. Additional information is available on EO Technics’ home page. Semiconductor Laser Marking SLD series is configured with a highly advanced diode pumped solid-state(DPSS) laser with high speed, low operating cost & superior beam quality for marking on moving compound. The SLD series can be configured assingle-head or dual-head with optional second harmonic green (SHG) laser. The company’s SD Card Laser Cutting BMC Series shows fast, flexible and cost effective operations when cutting Micro SD Card over the traditional cutting machines. scanner makes the system more reliableand improves the drill speed. 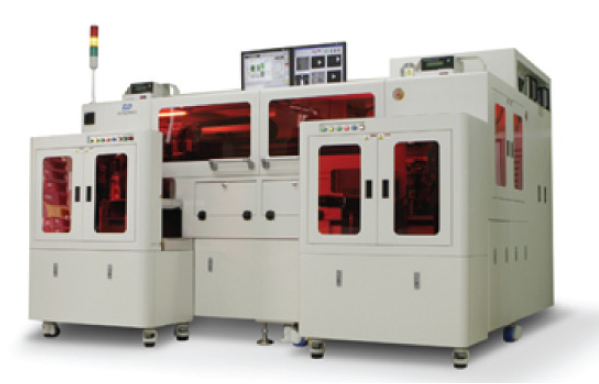 According to the application and type of PCB,loading/unloading systems can be modified according to the user’s request.